The First Ever Athens Jewish Film Festival College Night. Thursday, March 21, 2019 @ 7:00 p.m. There will be a question-and-answer session with the film’s director Adam Hirsch. 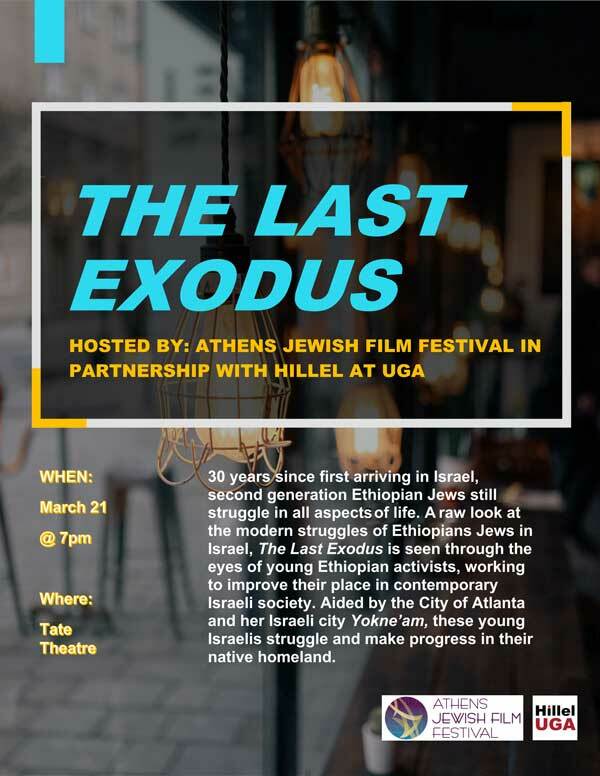 This year, the Athens JFF is pleased to partner with Hillel at UGA to present a special film at Tate Student Center Theater for the UGA community. Thirty years since first arriving in Israel, second generation Ethiopian Jews still struggle in all aspects of life. A raw look at the modern struggles of Ethiopian Jews in Israel, The Last Exodus is seen through the eyes of young Ethiopian activists, working to improve their place in contemporary Israeli society. Aided by the City of Atlanta and her Israeli sister city Yokne’am, these young Israelis struggle and make progress in their native homeland.